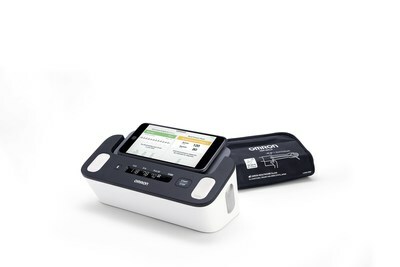 LAKE FOREST, Ill., April 11, 2019 /PRNewswire/ -- Omron Healthcare, Inc., the global leader in personal heart health and wellness technology, has secured FDA clearance on its new Complete™, the first blood pressure monitor with EKG capability in a single device, and will open pre-orders on April 15th at 12:00 pm CST in the U.S. on OmronHealthcare.com. "Millions of Americans are living with Afib and a stroke risk that is five times higher than average, and many others may not know they have this condition since it is difficult to diagnose. Recent studies2 predict that the number of individuals with Afib could reach epidemic levels as a result of the growing aging Baby Boomer population. Monitoring this condition and the risk it carries is part of our Going for Zero mission. That's why Omron developed Complete as an accessible, easy-to-use, at-home solution to provide a more complete heart health picture and greater peace of mind," said Ranndy Kellogg, president & CEO of Omron Healthcare, Inc.
"Irregular heartbeat is unpredictable and can be difficult to detect without regular monitoring. The Omron Complete empowers anyone who suspects they might have arrythmia or has family history of the condition to monitor their status easily at home," said Kellogg. Complete is the recent recipient of the iF Design Award 2019, presented by iF International Forum Design GmbH, one of the world's most prestigious design awards. This award was presented to Complete for its uniqueness, innovation, aesthetic appearance and performance.